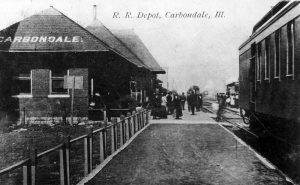 Station Carbondale was established in 1995 for the purpose of restoring the 1903 Illinois Central Railroad passenger station in Carbondale, Illinois, and to establish a railroad museum preserving the history of the railroads of Carbondale. Station Carbondale began as the Station Carbondale Restoration Committee, formed within the Carbondale Uptown citizens’ group that began working to renovate the downtown area in the late 1980s. The preserved brick passenger station in Carbondale was built in 1903, and was the third passenger station to serve the growing city. The building was renovated and expanded in 1930, and remained in use through the golden age of passenger service on the Illinois Central Railroad. The station continued in use after Amtrak took over passenger train operations on May first, 1971, and was replaced by Carbondale’s current Amtrak station on December 21st, 1981. Following the end of the station’s use for passengers, the railroad leased space inside to local businesses for a time before moving railroad offices into the building. The railroad continued using the building, which was becoming an eyesore to some, until much of the railroad’s downtown property was purchased by the city of Carbondale in 1989. Restoration of the station took place in increments. First, the outer brick walls were stabilized while new downspouts were added and the roof tiles replaced. Renovation of the interior followed as funding permitted, beginning with asbestos removal, and work was completed in 1996. Station Carbondale had a statue of a passenger train conductor placed near the station on Main Street and a caboose on a display track beside the building in 1998. Retired GP11 diesel locomotive #8701 joined the caboose in 2000. 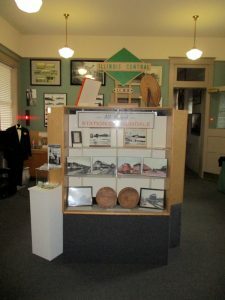 In 2003 the depot was added to the National Regiester of Historic Places, and in 2004 the dream of a display room full of railroad artifacts finally came true. The Carbondale station offers the visitor a unique opportunity to “experience” railroading by taking an interpretive hands-on tour through a real locomotive, caboose, and train depot. The onsite experience will pique your interest. 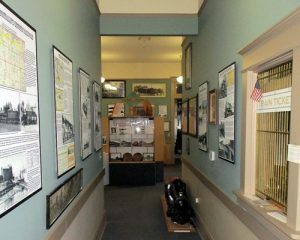 The exhibits within the depot provide information on the story of the railroad and the role it played in the history of Carbondale. The locomotive and caboose are open for group tours and student field trips by appointment, and visitors are welcome to tour the displays inside the station during regular hours of Carbondale Mainstreet and the Carbondale Chamber of Commerce. For occasional updates and historic information and photos, like Station Carbondale on Facebook! 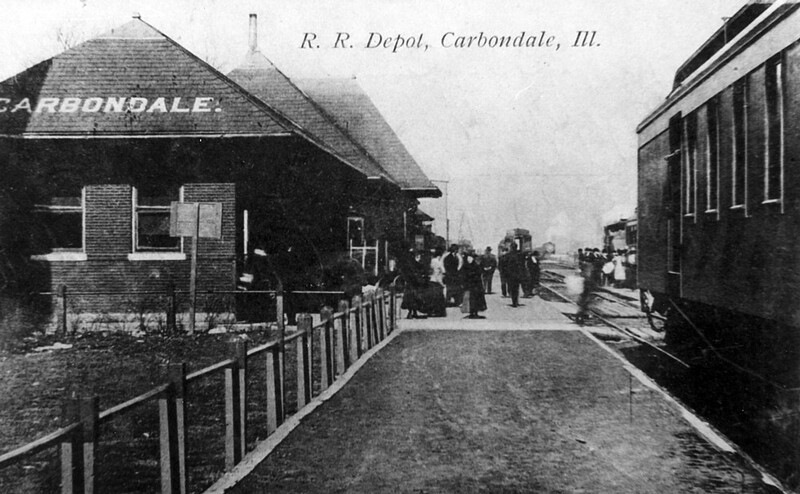 An early postcard view shows the Carbondale passenger station in its first decade of use. Photo courtesy of the Jackson County Historical Society. A northbound Canadian National train passes the old Carbondale station with preserved Illinois Central GP11 diesel #8701 on display outside.